Thank you for your interest in Docentric document generation and reporting tools. This fully functional 30-day trial version of Docentric Toolkit includes all features and 30 days of free technical support. Download and start playing with the provided examples now! Docentric toolkit ships with an interactive application called "Example Browser" which contains various examples. It is designed in a way so you don't need to write your own .NET application just to test the product and to find out whether this is the right tool for you. The application has plenty of examples showing different features in the contexts of different scenarios. 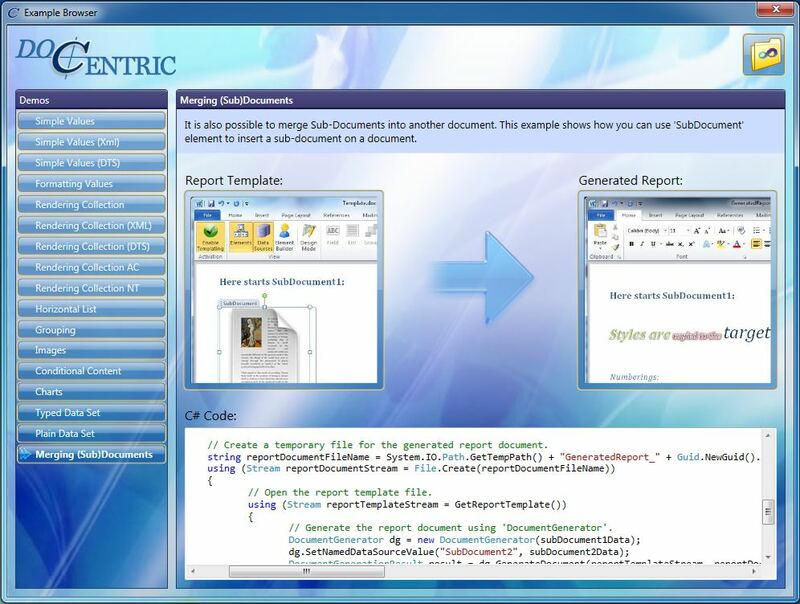 Each example shows the corresponding template, source code and the result in the form of a generated document. You can play with the template of any example by making changes	to it and instantly observing the changes in the generated document.